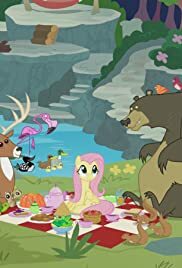 Fluttershy vows to look after Rarity's Manehattan boutique while she's away and takes on a series of characters in order to cope with the intimidating clientele. Rarity: [Fluttershy has insulted the raccoons once again] That's it! Fluttershy, I'm afraid you've left me no choice! You are terminated! Fluttershy: [snooty voice] Well! Good luck replacing me! Humph! Fluttershy: [goth voice] I always thought she was too controlling. Rarity: You- you- you are terminated, too! This episode's plot features Fluttershy having to take over Rarity's clothing store while she's away. She thinks she can't do this on her own, so she invents these three personalities to help her. That is admittedly an amusing concept. I missed seeing the other Mane 6 for the majority of this episode. Still, it had a lot going for it, especially how good the voices and animation are. I also love all the different designs the customers have.